Andrew Craig Brunson is a United States citizen and pastor from North Carolina. For over 23 years, he has lived peacefully in Turkey together with his wife and three children, who were educated in Turkish schools, and two of whom were born in the country. All this time, Andrew Brunson has been involved in serving as pastor of the Resurrection church in the city of Izmir. As the religious leader of the congregation, Pastor Brunson was known and respected by his own church and other Christian congregations, and the Brunson family have shown themselves to be people who love and respect Turkey and the Turkish society. As a religious worker, Pastor Brunson specially worked to keep political activities away from himself and his church. As explained by his lawyer, he considered that establishing political and financial relationships with governments or other groups would sully the religious beliefs in which he believes and he always defended this viewpoint. On October 7, 2016, as he arrived home, he found a written summons to report with his passport to a local police station. Believing the summons was related to his routine application for a renewal of his residence visa, Pastor Brunson promptly reported to the Izmir police that same day. There, he was informed that an order of deportation had been entered against him, as he had suddenly been deemed a threat to national security. From that day, Pastor Brunson was held in detention at the Harmandali Detention Centre and was denied access to an attorney until December 9th 2016 – over two months later – when he was transferred in the middle of the night to a high security prison in Izmir. At that time, he was informed that he was being detained as a suspect, although “evidence had yet to be gathered”, on the grounds of Membership in an Armed Terrorist Organization. Indeed, on December 9th 2016, the Izmir 5th Penal Court of Peace ordered that he continued to be detained pending the investigation. The ensuing months were filled with multiple appeals contesting his detention, which cited the legal deficiencies of the Turkish court’s decision. All of which were summarily denied, even though no evidence has been set forth to substantiate any crime. Interestingly, neither Pastor Brunson nor his attorney had ever been able to access any file or piece of evidence providing such an accusation, as his file has been sealed. The proceedings are stuck at the investigation stage and there is no indication if or when an indictment may be coming. So today, Andrew Brunson is still being arbitrarily detained in a Turkish prison, deprived of his rights, without any reason since he has not been officially charged - nor ever convicted - as there has yet to be an indictment handed down. Turkey, a member State of the Council of Europe, signatory of the European Convention on Human Rights continues to maintain Andrew Brunson imprisoned, denying then his fundamental and basic rights, and depriving furthermore a whole family of a husband and a father. In a similar recent case, the European Court ruled in favor of several applicants who were charged of membership of an illegal organization and found that the Turkish Government had not provided any evidence of a link between the applicants themselves and the presumed criminal organization. It therefore held that the interpretation and application of the legal provisions relied on by the domestic authorities had been so unreasonable as to render the applicants’ deprivation of liberty unlawful and arbitrary. Therefore, there had been a violation of Article 5 §1 (right to liberty and security) of the Convention. Also, regarding the right to a fair trial, Turkey had been recently condemned for national proceedings judged unfair as a whole. In this case, the applicant, a Turkish citizen charged with membership of an illegal organization had been left unable to examine or have examined witnesses whose statements were relied on for his conviction, and was deprived of legal assistance when he was held in police custody. While in prison, Pastor Brunson has lived under inhumane conditions, has lost over 50 pounds and has spent extended periods of time in a cell meant for eight people, but which at times has held as many as 22 prisoners. 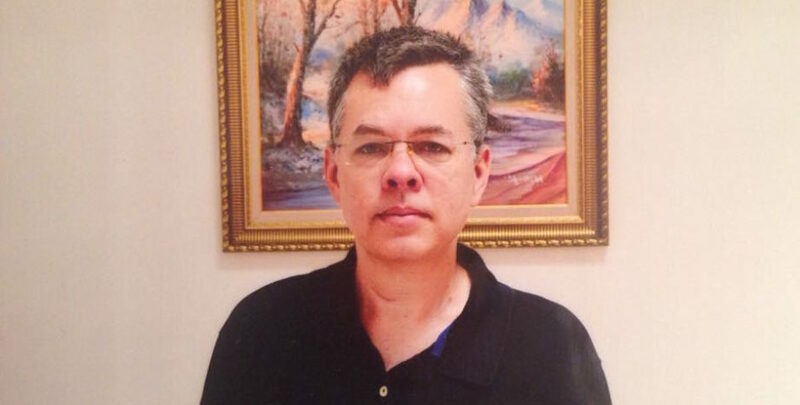 As for now, Pastor Brunson’s plight has caught the attention of hundreds of thousands of people around the world and there have been an unprecedented amount of high level demands for Pastor Brunson’s release. And yet, on August 24, 2017, the Turkish government decided to levy new and additional accusations against Pastor Brunson, these just as ludicrous as and even more disconcerting than the original. They include, Political or military espionage, Attempting to overthrow the Government, Attempting to overthrow the Turkish Grand National Assembly, and Attempting to overthrow the Constitutional Order, with the last three not only carrying aggravated life sentences but requiring that the accused used force and violence. And once again, no evidence has been put forth to substantiate such ridiculous accusations. Pastor Brunson has and continues to adamantly maintain his innocence and deny all the accusations. And so the question remains, why are they still holding him? President Erdoğan himself answered this question when he recently demanded a swap of Pastor Brunson for Fethullah Gülen, the cleric Erdoğan blames for the failed coup attempt in July of 2016, and who has now found refuge in the USA. The allocutions from the President of Turkey himself confirm that Pastor Brunson’s abusive detention follows Turkey’s political agenda within its relationships with the USA. It also attests of the arbitrariness of Andrew Brunson’s incarceration who has simply become a bargaining chip for Turkey. This scandalous injustice needs to be officially recognized by the international community as a whole, and every effort must now be used to put an end to Pastor Brunson’s dramatic situation. Sign ou petition for his release here. ECHR, Mergen and Others v. Turkey (applications nos. 44062/09, 55832/09, 55834/09, 55841/09 and 55844/09) and ECHR, Ayşe Yüksel and Others v. Turkey (nos. 55835/09, 55836/09 and 55839/09), 31 May 2016. ECHR, Gökbulut v. Turkey, Application no. 7459/04, 29 March 2016.